Everyone in Ottawa is preoccupied with thoughts of a new building for the Civic site of the Ottawa Hospital. The local Member of Parliament and Environment Minister, the Hon. Catherine McKenna, expressed concern that the site chosen on the Central Experimental Farm would destroy valuable agricultural research. As well, the increased size would turn the rest of that green space into the staging area for a large healthcare factory. As well as the Minister, Kelly Egan, the Ottawa Citizen columnist, decried the lack of true public consultation and raised a point that the planners for a new Ottawa Hospital seem to have overlooked: “hospitals are not the best vehicle to deliver basic health care”. It is exactly this lack of vision about the function of hospitals in the future that troubles me. So far, the discussion seems not to have considered that there are many who believe that we must move health care away from hospitals, especially basic care. What is basic health care? For most of us, basic health care consists of the minimum health care necessary to prevent illness and to manage chronic disease. For most of us, it is the care delivered by our primary care physician, with some diagnostic tests and pharmacy consultations included. That care is minimal when we are healthy, although even healthy people require greater basic health care at the beginning and end of our lives. The care at the beginning of our lives is mostly preventative while the care we require as we age usually includes some attention to chronic illnesses that we develop. Chronic illnesses are those with symptoms that wax and wane, becoming acute only periodically. These are illnesses like hypertension, chronic obstructive lung disease, or depression. The people with the most chronic illnesses are older people, and what do older people want for their health care? As the doctor in my family, I have had a lot of experience in health care with the older people in my family. I have a good sense of what they want, and, as I age myself, I am getting an excellent idea of what I don’t want. I do not want more and bigger hospitals. I do not want to spend my final years in or visiting some healthcare factory. As I have watched older and less healthy family members struggle with chronic illnesses, I realize that their least happy times were when circumstances forced them to be admitted to hospital. Having said this, this is where all of them died, despite their wish to die at home. From visiting many relatives in hospital or in their long term care residences, I know that these views are not unusual. Almost every older person I know feels this way. The Ottawa Hospital is not necessarily at fault in this situation. One of the most innovative institutions in the country, it has responded to community needs and bears the responsibility of having to be everything our community wants in a university teaching hospital. It provides excellent care by devoted staff and is desperately In need of updating. But how does a community balance the needs of patients and families with the need for health care delivered efficiently? One agency that certainly seems to be considering what the public wants and needs is MaRS. MaRS Innovation is a not-for-profit organization based in Toronto that seeks to bring medical research to market. You can find out more about this organization from their website but I wanted to show how their analysis of health care transformation affirms the view that care must move away from hospitals and into communities. 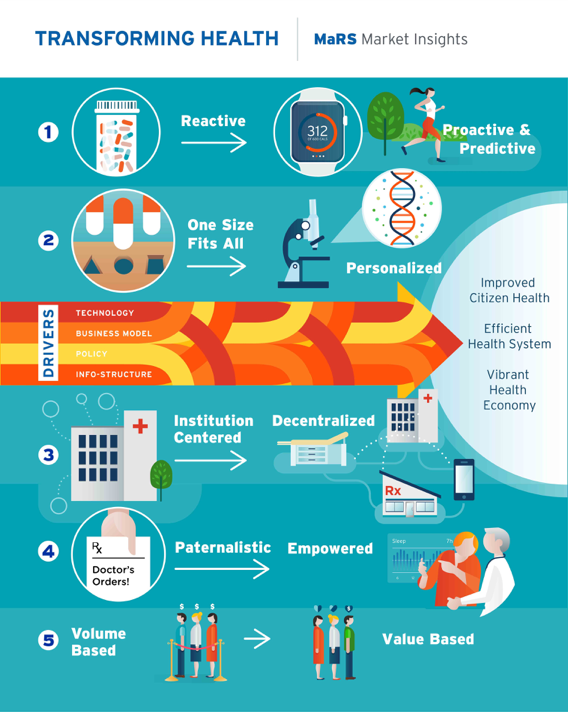 The infographic (included below) in the description of their Transforming Health event shows how decentralization away from large institutions could transform health care. Please provide my health care to me at home, as much as possible. I will happily skype my doctor while instruments read my vital signs. If need be, the appropriate health care provider might drop around to my home for more complex tasks like drawing my blood or completing a health exam. Please make sure it is convenient to get my blood work and other diagnostic tests completed. Some evening hours would be good so that my wife (or daughter, or son, or neighbour) doesn’t have to miss work to look after me. Please make sure my family doctor gets reports as soon as possible. Giving me a copy might help with that. It would be nice if my wife (daughter, son, neighbor) could run other errands while I am waiting for my appointment. Could this clinic be in a mall? Since what I do in hospital most of the day is wait for doctors, could I not do this at home with nursing care? All of these wishes confirm that there is a desire for more care in our communities, not necessarily a desire for a bigger hospital. As well, when one considers how many people are waiting for long term care, are more hospital beds needed or more long term care beds? In the interests of full disclosure, I must add that I currently live one kilometre from where the Ottawa Hospital would build a new Civic site and I dread the impact it will have on my neighbourhood. Like my neighbours, I am distressed at the thought of a huge industrial health complex taking over more of my neighborhood than it already does. Like my neighbours, I understand the importance of the agricultural research at the Central Experimental Farm that will be destroyed if the building is placed on a site there. The Canada Agricultural and Food Museum, and its young visitors, will be affected by such complex development. Is there no concern about that collection of heritage Canadian animals? But, most importantly, will the public discussions include patient and family consultations?